In the first part of this occasional series, we focussed on antibiotics and the most common – but least recognised – source of them. The food we eat. Today we keep the spotlight on food, but from a slightly different perspective. The chemicals conventional farmers rely on to produce it. The farming we’re familiar with today – large fields of identikit crops – is a very recent phenomenon, dating back to the 1940’s and 1950’s. It relies heavily on chemicals – generically known as pesticides – to address every threat a crop may to face. Weeds competing for space and resources. Insects damaging or eating it. Plant diseases affecting yield or making the crop unsaleable. Do a little research and you’ll discover a huge number of chemicals licensed to be used in farming alone. Dig a little deeper and you’ll find the same message repeated over and over again. That they are subject to rigorous testing before licensing. Once licensed, regulatory authorities police their use. They quickly break down after use, so only small amounts are found in our food. Well, yes, all chemicals do have to go through a testing procedure before being licensed for use. However, this process only focuses on the so called main “active ingredient” in each product. By doing so, it misses the effects of the interactions between all the different ingredients each product contains. Added to this, the product isn’t usually tested over the longer term to determine its effects after years or decades of use. And, yes, there are regulatory authorities. Sadly, time and again they have found to be reactive rather than proactive. Only looking at concerns long after they were first raised. Or the weight of evidence is so overwhelming that it can’t be ignored any longer. Newer products are said to breakdown more quickly – and easily – after use. Again, while this may be true, what about the effects on soil or ground water? Or the next crops to be grown in that field? And are any remaining residues automatically safe? And, finally, it may be true to say that the actual residues remaining in the food we eat are small. It sounds so reassuring doesn’t it? Bringing with it the assumption that minute amounts of any chemical are automatically safe. Parts per million or billion. But doesn’t this miss the point? Hormones, enzymes and other chemicals naturally found in the body are only found in minute amounts. So if the body is affected by them, wouldn’t it also be affected by minute amounts of manmade chemicals too? Let’s put one real life example under the spotlight, which has been a concern for many years. Glyphosate, otherwise known as Roundup. Roundup is a broad spectrum herbicide. It’s used to kill weeds and stop them competing with the crop being grown. 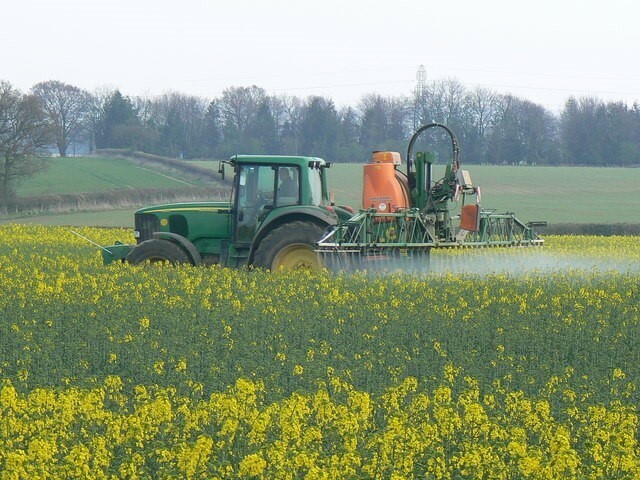 Developed by Monsanto in the early 1970’s, it quickly became popular with farmers, as it allowed them to quickly and easily remove weeds from a crop. Up until then removing weeds was a very time consuming – and far from guaranteed – process, done by hoeing or hand. As time went on, Monsanto developed crops resistant to Roundup, known as “Roundup Ready.” This allowed crops to be directly sprayed with it, killing only the weeds and leaving the crop unharmed. Jump forward a couple of decades and many of the crops developed to be resistant to Roundup were also genetically modified. GMO’s. Look at the general fact sheets for Roundup and it all sounds very reassuring. Low toxicity. Easily excreted from the body. Quickly broken down in the soil. Sadly, what tends not to be mentioned, is how easily Roundup is absorbed from the digestive system into the body. And once it’s passed into the blood stream, it’s then free to affect every part of the body. So, saying that Roundup is quickly excreted from the body, only provides part of the picture. It fails to highlight what happens in the meantime. Numerous studies have found that glyphosates in general not only disrupt the natural balance of the digestive system, but also the absorption – and synthesis – of vitamins and minerals. They’ve been linked to the soaring rates of many different health issues, particularly allergies, autism and birth defects. Added to this, recent research has shown that Roundup is much more toxic than first thought. Up to 125 times so, due to the interaction of its various ingredients. At the same time its usage has increased dramatically. Manufacturer recommendations are to use it several times during a crop’s life cycle and, more worryingly, just prior to harvesting to promote ripening – as well as making the crop easier to harvest. Added to this, is the huge increase in the number of Roundup resistant GMO crops. And this is without taking in to account its use by gardeners. Given all of this, it’s hardly surprising that conventionally produced foods are providing consumers with numerous doses of glyphosates each day. Processed foods are the worst offenders, relying on cheaply produced ingredients, to make them affordable. However, conventionally grown, non organic fruit and vegetables, also contain glyphosates. And don’t forget other foodstuffs too, such as meat and dairy products, where the animals are fed conventionally produced soy and cereals – which are often GMO too. As always, it’s quite simple. Cook from scratch at home. Don’t rely on processed foods where you can’t be sure of the ingredients – or where they came from. Buy organic, wherever possible. If you can, grow your own – or go to your local farm shop. Come the summer, many people are happy to sell their excess fruit and veg, so why not keep an eye out in your local area? A regular detox can help mitigate the ill effects of any chemicals in the food you eat. As can taking a good quality probiotic, to help maintain your natural digestive balance. We know the issues we raise can often seem overwhelming – and rather depressing. But that isn’t our intention at all. It’s about helping to open your eyes. To make conscious decisions about things that affect your own health, rather than falling for the hype.